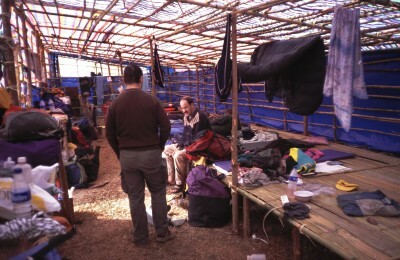 In 1992 already European expeditions to Meghalaya were conducted. Before, the country was not accessible for foreigners due to political turmoil. The expeditions are usually joint projects: The UK, Germany and India are involved, however, especially in the past couple of years there are participants of other countries such as Austria, Switzerland and the US. Members of the Meghalayan Adventurers Association (MAA), located in Shillong are always part of the expeditions. They are indispensable for the preparation but also for the actual research work. Simon Brooks from England and Daniel Gebauer are the managers of the tours and have the overview. Regarding preparation and coordination on site Brian Karpran-Daly is the contact. Despite the expedition-like character of these tours it is mainly the MAA’s support and Brian’s support that make such a tour possible for participants with limited time and budget. Further information on these expeditions can be found in the “Abseiler”, the “Verbandsnachrichten” of the VDHK and since very recently in the “Berliner Höhlenkundlichen Mitteilungen” of the past years. Members of the Arge participated in 5 expeditions to Meghalaya in total. In the northern part of Bangladesh and to the south of Assam the Shillong massif arises which mainly consists of coarse-grained granites and banded gneiss from cryptozoic eon. Shelf sediments of the Tethys Sea consist of Paleocene and Eocene layers and mainly consist of alternating sand rocks and sandy limestone with fragmented coal seam, layers of slate and marl. In the course of the Himalaya bulge first the eastern part turned into land and lateron the eastern part. The tickness as well as the diversity of the layers decreases from east to west. In the Cherrapunji and Mawsynram area the average precipitation amount is highest in the world, namely about 12 000 mm per year, which amounts to 12 meters of water per square meter (compare: Tübingen has about 750 mm of average yearly rainfall)! This affluence of water along with the subtropical climate indicates what kind of potential of karstification this area holds. And indeed: At the end of 2009 more than 1,200 caves are known in Meghalaya and over 330 cave kilometres measured. 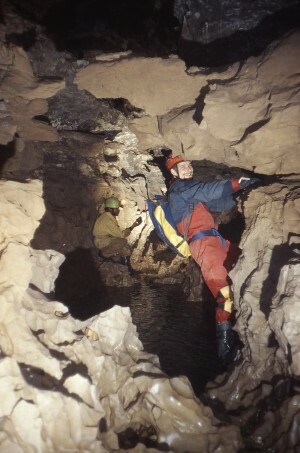 The longest caves are over 20 kilometers long. These are mainly water bearing caves. And still many potential cave regions are not even gleaned let alone explored. Work for many generations of speleologists!